After our less than stellar departure from the St. Regis Bangkok, we headed to Bangkok’s Suvarnabhumi Airport. I wanted to spend a bit of time in the lounge, try the food, do some shopping and spend a few minutes exploring the airport. We took a cab and ended up arriving at the airport around 20h15. The business class check-in area was nearly empty and we were quickly checked in for not only the flight that evening but our connection in Seoul as well. We were presented passes to the business class lounge as well – although the pass wasn’t needed since we were flying business (our boarding pass would let us in) and we have Star Alliance Gold Status with United (and I have it on Turkish too). We were presented with a completely empty Security and Immigration area – so from the time we exited the cab until we were air side was approximately 10 minutes. Pretty great. We decided to lounge-hop, trying out the various business class lounges in the terminal. The food was pretty dismal at each outpost though. I guess only the First Class Lounge, which we didn’t get a chance to experience, had the top notch cuisine. We did manage to get a complimentary foot massage in one of the business class lounges though. I think I had more massages (full body or foot) in this two week trip than I had over the past 5 years. The plane that would take us to Incheon was parked at a remote gate – so we loaded into a bus and headed to an outstation. There were two sets of stairs leading to the plane, one at 1L and one at 2L — Business Class boarded though 1L. We were one of the first people aboard the plane and were greeted by a stew who offered us each an amenity kit and a pre-departure beverage (yes, we opted for champagne, it was better than what we got on the way to Hanoi, but not as good as the 2003 Dom — even though the 2003 isn’t all that great of a vintage). The seats on board were the old style angle flat seats, which were better than we’d flown here, here, here, here or here, but not nearly as good as here. We didn’t even opt to have the meal on the plane since we left close to midnight and were hoping to get some shut eye. The business class cabin was about half full. Once we told the stew that we were going to skip out on the late night meal, she made sure we had a full glass of mediocre champagne for the first hour, but then was gone (which is when we decided to sleep). I woke up slightly before 05h00 and decided to watch some TV shows on the IFE before breakfast. As soon as the stew saw that I was awake, she was over very quickly asking if I needed anything and delivered a bag of cookies…although I didn’t see these anywhere else in the cabin, nor did I see any other passengers with them — maybe they were just from her purse, in any event they were tasty as I was getting hungry. About an hour before landing, breakfast was served. I decided to have the fruit plate, which was again mediocre at best. The worst part — no more champagne (even if it was run of the mill). When booking this flight, I was surprised that Thai had two flights from BKK-ICN leaving within 30 minutes of each other, plus one Asiana flight leaving at the same time. Three Star Alliance flights within 30 minutes of each other seemed out of the ordinary to me — obviously there is quite the demand, eh? This flight was perfectly acceptable. The flight itself was pretty empty (at least in Business) and the service was relatively attentive (but left us alone when we wanted to be left alone). The champagne was disappointing (but a near midnight departure shouldn’t have passengers up all night boozin’). 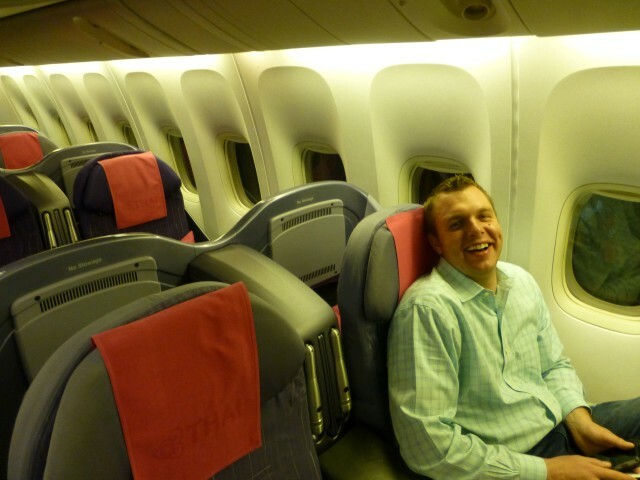 I would have preferred fully flat seats — I was spoiled on Thai’s A380. I really find the angle seats to be tough to sleep comfortably on as well. All in all, this was a perfectly acceptable flight. I’d take it again if the timing and availability worked out. Have you flown this or the other midnight flight from BKK-ICN on Thai? What about the Asiana flight or the Korean Air flight on this route? How do you handle the running out of Champagne on a flight??? By Tim in Travel on February 20, 2014 .